During each player's End Phase, each player can Special Summon 1 Level 4 Normal Monster from his/her hand. we now have the 1850's and 1900s necessary to use it effectively. Just WATCH OUT for the Gorillas. This card is pretty interesting. It's a Continuous Spell, making it vulnerable in both formats; but chances are your opponent won't bother removing it. How much of a threat could a Level 4 Normal Monster be, right? Well...they can be good. We have Archfiend Soldier, Gemini Elf, and Mad Dog of Darkness. Those three equate to a generally powerful Beatdown. This card might be good when used with Familiar Knight; swarming with high-ATK monsters gets fairly easy. Use this in a Beatdown with a lot of Normal Monsters. I don't see much use for it anywhere else, unless you misread the text and think it includes effect monsters. considering there are three monsters in the picture. Normal Monster in competitive deck? Water Decks are the only decks that use many Normal Monsters, so if you use a Water Deck, there you go. Effect – Bad. playing. A Legendary Ocean and Cost Down would allow you to Special Summon higher level Normal Monsters, but it wouldn’t be worth it. their opponent would love this card. monster from his/her hand.” Wouldn’t that have been great? Yep, it would. Traditional Format: 1/5. Stalin Deck. Another "equalizer" card that turns out to be anything but. At first glance, this card is dead even. At the end of a turn, a player can Special Summon a monster of exactly Level 4 THAT DOES NOT HAVE AN EFFECT to the field. 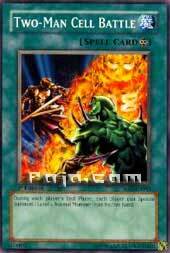 Soul of the Duelist is trying to let the "normal" deck come into play again, as we all used our Beatdowns back in Pharaoh's Servant. This card ends up being almost completely one-sided. When is the last time you saw a non-effect monster being played in any REALLY competitive area? It's been a while, save the Archfiend Soldier/Mad Dog of Darkness being used as an extra Dark type to bring out a Chaos monster. The player using it will get to pretty much get an extra summon at the end of turn. However, this is just as much of a blessing as it is a curse. The summon is at the END OF TURN -- this allows your opponent their whole turn to deal with what you might be planning. If you dropped a Lv. 4 beatstick in hopes of Tributing it next turn, it most likely won't happen. Letting the opponent know what you're going to do a turn in advance is a death sentence for any strategy you planned on with the card they know about...not to mention the loss of hand advantage. I WILL say this, however; a deck focusing COMPLETELY on non-effect Beatdown can work well -- Archfiends, Mad Dogs, Geminis, non-Spellcasting Area, Heart of the Underdog (which can work more than once in the same Draw Phase, last I checked! ), and the other Normal support cards can give non-effect monsters abilities that rival the orange-colored monsters we've all grown to love. dawnyoshi Two-Man Cell Battle is the ultimate special summon card for the vanilla beats deck, which abuses cards like Heart of the Underdog and Non-Spellcasting Area to make these standard attackers insanely powerful. This card easily helps in swarming the field with massive attackers. It's also good for providing sacrificial bait for larger beatsticks such as the Summoned Skull. Unfortunately, traditional format has a lot of ways to deal with these little beatdown monsters, but this thing is a godsend for vanilla monsters in the advanced format. In limited, this card only works with Skull Dog Marron. However, it's always good to have some sort of special summon potential. This always helps for summoning higher level monsters.